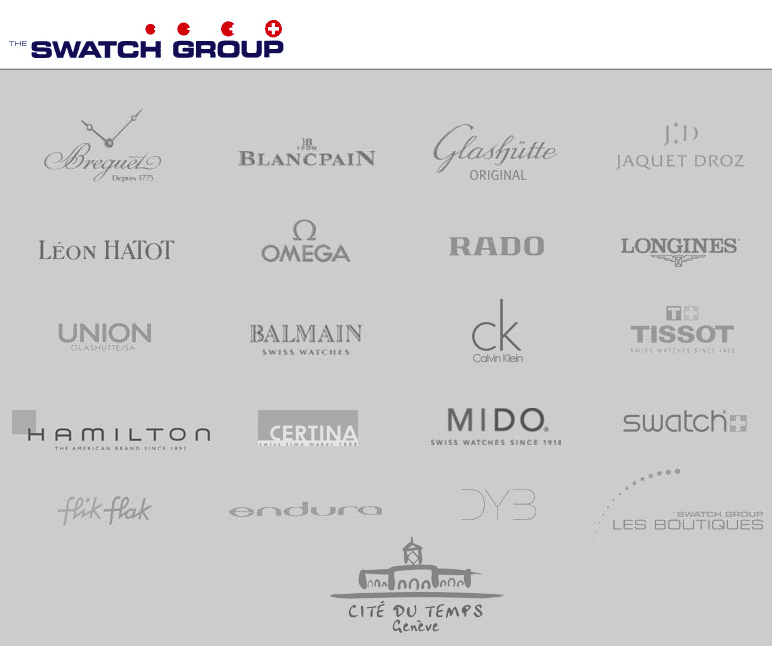 The Swatch Group Ltd. is a Swiss company and the biggest watch manufacturer in the world (about 25% of the sales). It owns some of the most famous and fine brands of watch of the history of watchmaking. Its brands include Breguet, Blancpain, Jaquet Droz, Glashütte Original, Union Glashütte, Léon Hatot, Omega SA, Rado, Longines, Swatch, Tissot, Calvin Klein, Certina, Mido, Pierre Bal-main, Hamilton, Flik Flak and Endura. It was formed in 1983 through the merging of the two Swiss watch manufacturers ASUAG and SSIH, and took its present name in 1998 (formerly SMH Swiss Corporation for Microelectronics and Watchmaking Industries Ltd). In 2003, gross sales were 3.983 billion CHF. The Swatch groups employs 20,000 collaborators.